Heat grill. In medium saucepan, combine potatoes and enough water to cover. Bring to a boil. Reduce heat to medium; cook 5 to 6 minutes or until almost tender. Drain; cool slightly. Alternately thread halibut, partially cooked potatoes and zucchini onto four 12 to 14-inch metal skewers. In small bowl, combine all remaining ingredients; mix well. When ready to grill, oil grill rack. 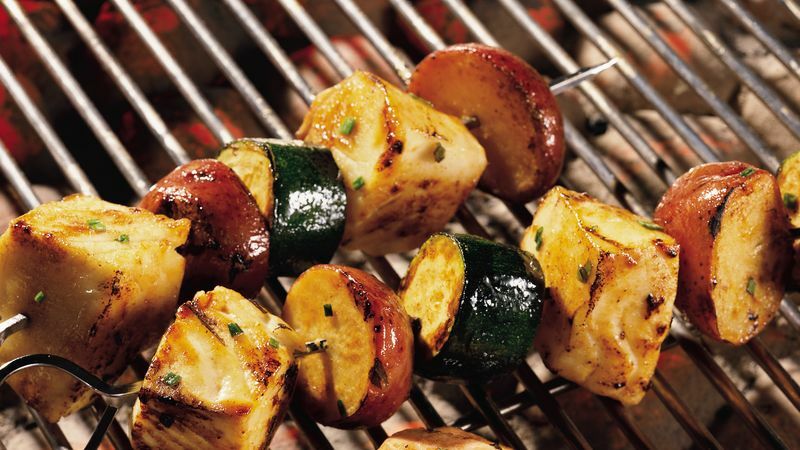 Place kabobs on gas grill over medium heat or on charcoal grill 4 to 6 inches from medium coals. Brush kabobs with chive mixture. Cook 10 to 15 minutes or until fish flakes easily with fork and potatoes are tender, turning and brushing frequently with chive mixture. Discard any remaining chive mixture. To broil kabobs, place on sprayed broiler pan; broil 4 to 6 inches from heat using times above as a guide, turning and brushing frequently with chive mixture.